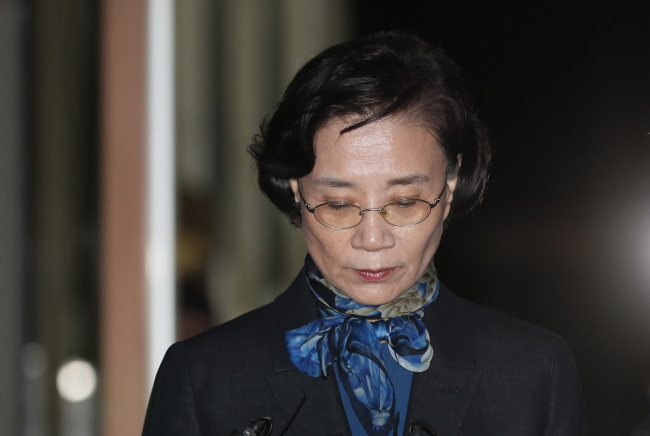 Lee Myung-hee, the wife of the Korean Air Lines Co. chief, appeared for police questioning for a second time on Wednesday over multiple assault and abuse allegations. Her appearance at the Seoul Metropolitan Police Agency comes after she underwent a 15-hour interrogation by police on Monday. Police said the second questioning is to mainly supplement the ongoing investigation, as she has denied most of the charges and witnesses' statements show inconsistencies with hers. Police indicated Tuesday they could seek an arrest warrant for Lee and the decision will be made before the end of this week. The director of Ilwoo Foundation is accused of shoving and cursing at construction workers hired for the expansion of a hotel owned by Hanjin Group, which includes Korean Air, in 2014. She may face a charge of aggravated assault as a witness testified she hurled scissors at them. Lee, 69, is also suspected of physically and verbally assaulting workers at her Seoul mansion when it was being remodeled, as well as habitually abusing company employees, private chauffeurs, security guards and housekeepers. Lee and her two daughters, including Cho Hyun-ah, who is infamous for the "nut rage" case, are being probed over mounting allegations of abuse of power, assaults, tax evasion and smuggling luxury goods. Police have secured statements from more than 11 witnesses who say they want Lee to be held accountable. By law, assault charges cannot be pressed against a suspect unless victims seek punishment.